Nothing compares to the joy of witnessing survivors who got a spark of hope in their eyes especially those on the brink of giving up. This is what employee volunteers from Cherry Mobile experienced when they flew to different locations in the Visayas region to reach out to more than 12,000 families affected by the typhoon Yolanda. 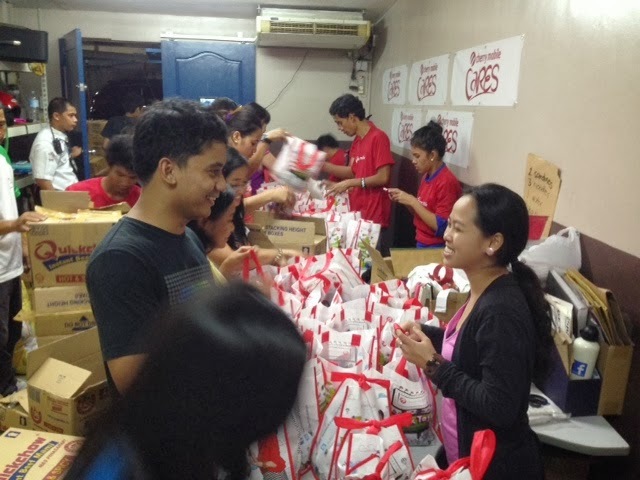 While the majority are focused on helping the victims in Tacloban, the relief operation team composed of employee volunteers from Cherry Mobile went to northern parts of Iloilo, Roxas City, Cadiz, Negros Occidental, Bantayan Island, Cebu, and Ormoc to give relief packs to communities that are not highlighted in the news but also suffered greatly from the typhoon. A lot of preparations were made, and one sure thing out of the list is wasted time. 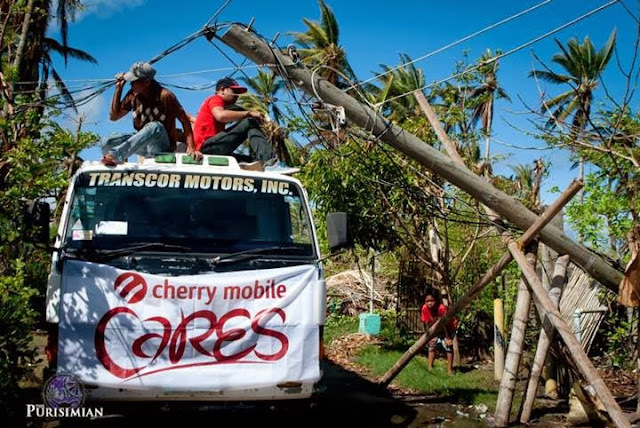 As soon as the news was heard on air, the Corporate Social Responsibility (CSR) team of Cherry Mobile coordinated with the dealers and partner organizations in locations where the typhoon struck a lot of families. The relief team was divided into six groups to personally hand out help to the communities. These communities were totally devastated. People suffered from hunger and extreme heat at daytime due to absence of trees which were destroyed by the super typhoon. People chilled at night, suffering from torn houses, washed out farms and crop fields, fallen electricity posts, and lost loved ones. Areas in Bantayan, Cebu, and some municipalities in Iloilo suffer loss of electricity for weeks due to fallen electricity posts. The typhoon withered crop fields and farms, leaving the communities profitless and foodless. Employee volunteers, the staff of Cherry Mobile dealers, people from partner organizations, students from colleges and universities, and representatives from the local government units worked together in repacking the purchased goods, securing the logistics, and in distributing the goods personally. The whole process of planning and executing the relief operation was toilsome and it indeed took a great deal of time, strength, and resources from the volunteers. The cooperation of each involved party, however, made the burden less difficult to carry. Employees from Aerophone in Cebu gladly helped repack the goods in their office after work hours. Volunteers from Galleon Trading helped produce 2,086 relief packs for the affected municipalities in Cadiz, Negros Occidental. Pharmacy students from the University of San Carlos stayed late at night to prepare the relief packs for residents of Bantayan Island. Regional Emergency Assistance Communications Team (REACT) Philippines – Metro Cebu Group played a big part in distributing the goods in Bantayan Island. In this photo taken by a student volunteer from Colegio de la Purisima Concepcion, the volunteers had to lift up the wires of a fallen electricity post to be able to get through to the relief distribution venue. Students and faculty members from Colegio de la Purisima Concepcion volunteered their time and strength to help distribute goods to three barangays in Roxas. Despite all the stress, hunger pangs, sleepless nights and sickness (before, during and after the relief operation) experienced by the volunteers, all hardships were gone when the volunteers saw the smiles of the beneficiaries. They were willing to wait in long lines at very early in the morning or in the heat of the midday sun just to receive one share of relief goods. They were so grateful for what simple help they got from Cherry Mobile. The regained hope evident in their eyes proved that the relief operation, hard as it was, is not in vain. It helped them rekindled their shattered hopes and started to mend their broken spirits. Bantayan residents waited along the roads in hopes that a relief truck would pass by, and got an answered prayer. Kids get their share of food packs when the relief team distributed goods in Bacolod. It is amazing how calamity brings people together. The local communities gladly received people from other places who came to help, and the relief operation team gladly held out their hands to assist—not as an effort on their own, but as a collective action of different groups uniting for the purpose of uplifting those struck down by disaster. There were lots of challenges; as they say, there is no such thing as a perfect disaster relief operation. One could only wish that natural disasters would never again occur in our country. But one certain thing is that no matter what challenge may come, the strongest people—the Filipinos—will live to overcome it. This is the kind of lifestyle Cherry Mobile seeks to uphold and value: a lifestyle of hope and conquest.